"I've had nightmares in my time, but never anything like this." Columbia is steadily working its way through the great stop-motion animation films of Ray Harryhausen. Here it presents one of my favorites, particularly since it devotes a good deal of running time to the monsters rather than the love interests. Yes, at heart I'm seven years old, and this is the perfect movie for seven-year-old boys. In Sicily, a group of fishermen find a wrecked spacecraft with its crew mostly dead. Two survivors are recovered, though: Col. Robert Calder (William Hopper) and Dr. Sharman (Arthur Space). When they awake in the hospital they inquire as to where the specimen that they had has gone to. Alas, it has fallen into the hands of the highly annoying little boy Pepe (Bart Braverman) with an even more annoying accent and obsession with American cowboys. To get a cowboy hat, Pepe sells the specimen to a local zoologist, Professor Leonardo (Frank Puglia). It hatches into an unknown creature, and he soon learns that it grows tremendously fast. When he tries to take it to Rome, the thing grows to the extent that it cannot be held, and it's up to Col. Calder to stop it before it lays waste to the entire country of Italy. Even at a mere 82 minutes, the picture is mercilessly padded. We have endless scenes of officials being introduced to each other and shaking hands and exchanging pleasantries. Near the end of the film, a press conference goes into excruciating detail describing the situation that the viewers have just seen, without adding one iota of new information. And of course, there are Pepe's foolish shenanigans that could infuriate. But none of that really matters. The monster, the Ymir (named for a Norse deity in the publicity materials, but it is never so called that in the picture itself) is just incredibly cool and gratifying to the monster-obsessed kid that I was and still am. The stop-motion animation is loads of fun, and knowing the tremendous work that went into this project, all by hand, and the sizable proportion of screen time the Ymir gets, it's highly satisfying. Although it has been criticized as not being terribly sympathetic, the fact remains that it's a creature from another planet, and may well have motives and emotions of its own that are completely alien to us; turning him into a cuddly E.T. would have been a mistake and would have destroyed the impact of the creature. It's also nice to see scientists that were still being taken seriously while they are subtly subversive at the same time. They don't have an evil agenda, but have good reasons, briefly stated, for wanting to study the Ymir. In one of the human standoffs, the Italian authorities just want to kill the creature, while Calder not only looks for restraint for science, but seems to have an appreciation of the life form that could survive in the hostile environment of Venus that killed most of his crew. Hopper is fairly wooden and his thankfully brief romantic interest with Prof. Leonardo's daughter Marisa (Joan Taylor) with some mirthless intergender sparring is hardly believable. But none of that makes any difference when the Ymir is onscreen. In a nod to King Kong, there's a climactic battle at a landmark, the Colosseum, which follows hard on the Ymir's fight to the death with a bull elephant. Okay, that's contrived but it's a great deal of fun to watch as well. They literally don't make 'em like this any more. Image Transfer Review: Columbia, apparently in answer to complaints, provides this film in both a full frame and an anamorphic widescreen version. Harryhausen has recently been quoted as saying that most of his films (including this one) were shot full aperture and were matted to about 1.66:1 by theaters, and that 1.85:1 is usually a bit too tight. That effect is clearly visible here in the widescreen version, especially since in a number of sequences we lose much of the sight of the Ymir, most notably in his rampage at a farm. There is a ton of vacant space at top and bottom in the live action sequences in the full frame version; the best result probably results if you do your own framing at about 1.66:1 if you have an adjustable zoom on your player. 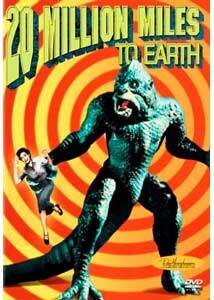 If not, I'd advise the full frame version so you don't miss any Harryhausen animation goodness. The print is rather speckled throughout, and some segments are a bit dark and murky. However, detail is very nice and textures come across quite well generally. A restoration would have been nice, but this is acceptable. Audio Transfer Review: The sound is a 2.0 mono that serves well enough. Music doesn't have much depth but it's not distorted or tinny either. Dialogue is quite clear throughout and I didn't hear any significant hiss or noise. This is a very clean and admirable period mono track that does the job. Extras Review: The only extras of note are two full-frame trailers for the feature and The Three Worlds of Gulliver. They look decent enough. The rest of the disc is taken up with the hour-long documentary, The Harryhausen Chronicles and the 1950s featurette This is Dynamation. While both are certainly worthwhile (the interview segments and clips from the documentary are invaluable), those collecting all of Columbia's Harryhausen discs will be disappointed to find there's nothing new here. Why not a commentary, or a new featurette or interview specific to the movie? Disappointing to say the least. But if this is your only Harryhausen disc, the extras are excellent, hence the high grade. One of the best showpieces of Ray Harryhausen's art, in a nice presentation, thoughtfully in both aspect ratios. But can't Columbia find some different extras?